Take A Self-Guided Historic Walking Tour Of Port Jeff Village! The weather has been so delightful, and unusual, but I’m not complaining. Do you enjoy walking and history? Well then you will love the 3 historic walking tour guides of homes, and historic places and events that took place in Port Jefferson. Thanks to the Historical Society of Port Jefferson who has put these tours together! The first tour begins at the Roe House, currently the home of the Greater Port Jefferson Chamber of Commerce, and covers much of East Main Street, ending at The Mather House Museum. Did you know that today’s Main Street was first called Jones Street? Its businesses supplemented the village’s shipbuilding industry which was the largest in Suffolk County. Four out of ten ships built in the county were constructed here. The village was the home of coastal schooner captains, blue water sailors and seamen. Most families had at least one or two members building ships or at sea. The second tour begins at the Mather House, which is presently the museum run by the Historical Society, and covers High Street, Thompson Street and East Broadway. Did you know that P.T. Barnum, the circus owner, played a significant role in the history and development of Port Jeff Village? He purchased land in Port Jeff to use as a base for his circus and to winter his animals, but the Village disapproved of his plan, so that never happened. He was very wealthy and owned hundreds of properties in Bridgeport CT, his home, and began wintering his animals there in 1871. Barnum Avenue in Port Jeff was named in his honor, where a good number of elegant and stately houses were built. The third tour starts at the Roe House, covers much of Main Street, ending at the Mather Museum. Did you know that our quaint village is home to the Port Jefferson Village Historic District, which was listed on the National Register of Historic Places in 2005? The district features 98 buildings in all, which is a mix of homes, commercial buildings, and a church. 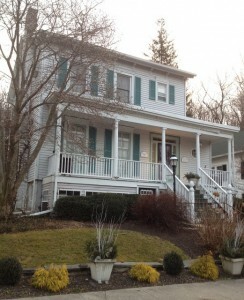 This beautiful, one-of-a-kind Historic Home is currently on the market in Port Jefferson. Don’t you just love this village? I am your neighbor, I am your realtor! Contact me anytime. My Service Is Exceptional! My knowledge, Powerful!